When most techies hear the name Huawei, they think about intriguing high-end phones like the P9 and Nexus 6P. They certainly don’t think about computing. That’s about to change. Following in the footsteps of Microsoft, Apple, and Samsung, Huawei launched its first-ever 2-in-1 tablet PC, which it first showcased at Mobile World Congress in February. 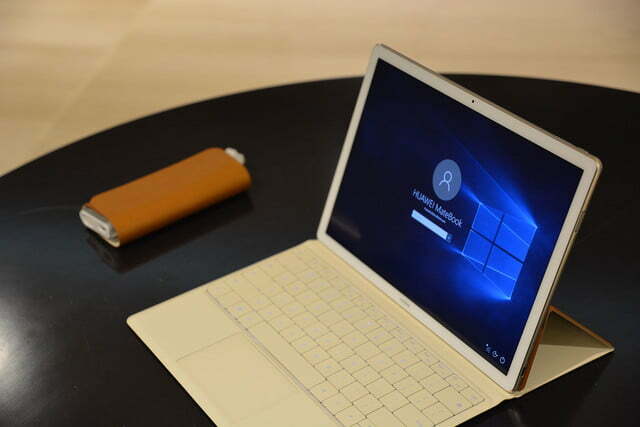 The MateBook is an incredibly slim Windows 10 tablet that connects to a nifty little keyboard folio case and a stylus. 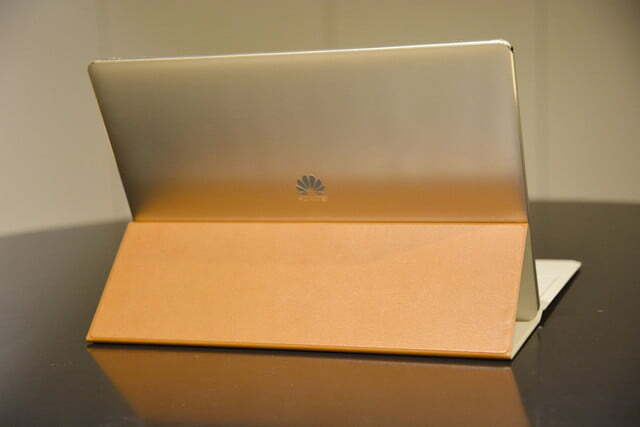 Here are our early impressions from MWC of Huawei’s first foray into the mobile computing world, plus all the details you need to buy one for yourself. 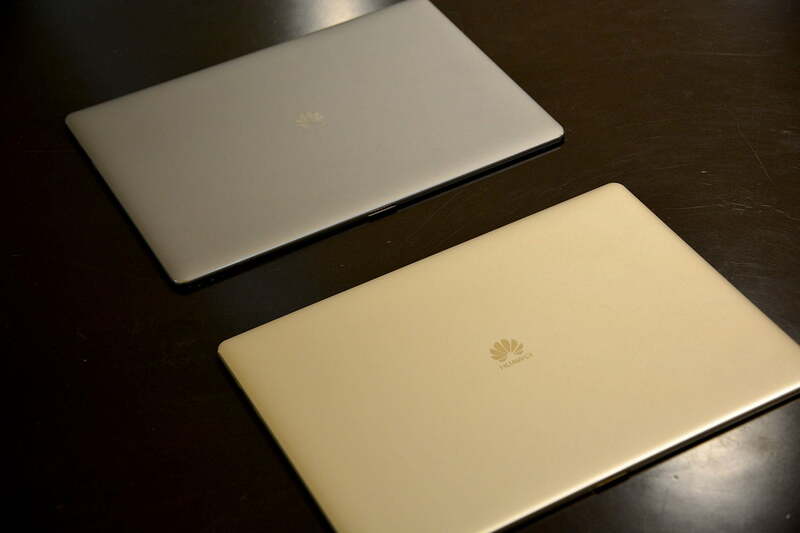 Huawei put the MateBook on sale in the U.S. on July 11, and there are several models available, all with different specifications. The base Core M3 costs $700 for 4GB RAM and a 128GB SSD, but you’ll have to get the keyboard for $130, the stylus for $60, and the dock for $90, if you want the whole kit. The prices go up from there. The Core M5 with 4GB RAM and a 128GB SSD costs $850, but the best model with 8GB RAM and a 512GB SSD costs $1,200 without the keyboard. 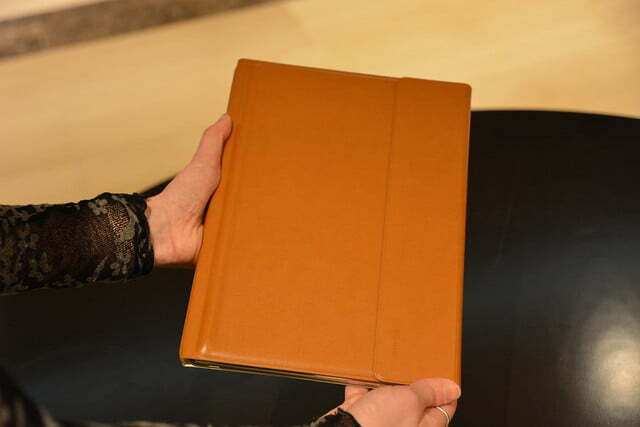 It’s sold through Microsoft retail stores, at MicrosoftStore.com, or through Amazon. 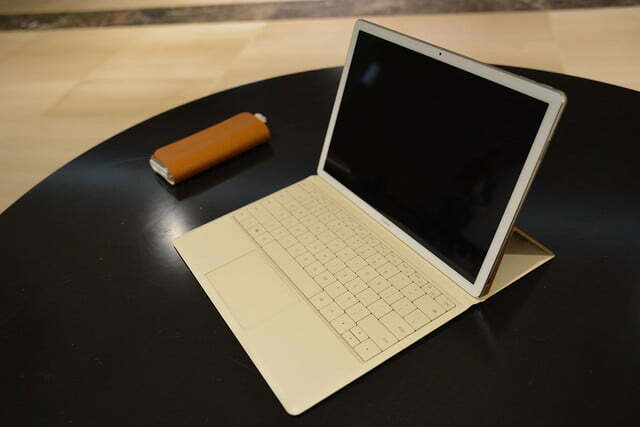 On August 12, Huawei released the MateBook in the U.K., where it’s sold through a selection of Curry’s retail stores. Those selling the MateBook include the branch on Oxford Street, and in Stratford, Manchester Arndale, Bluewater, and in Edinburgh. 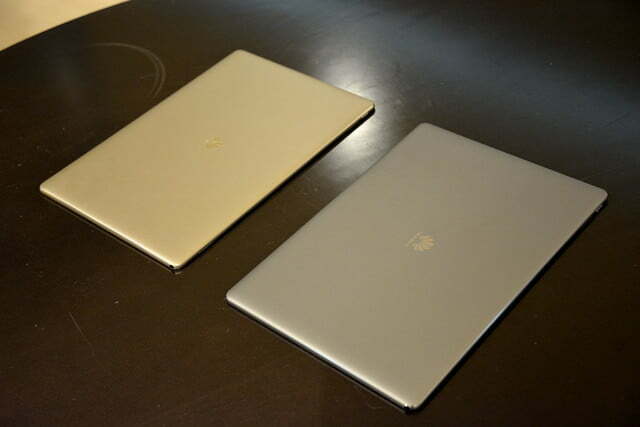 The M3 MateBook costs 750 British pounds, and the M5 is 1000 British pounds. 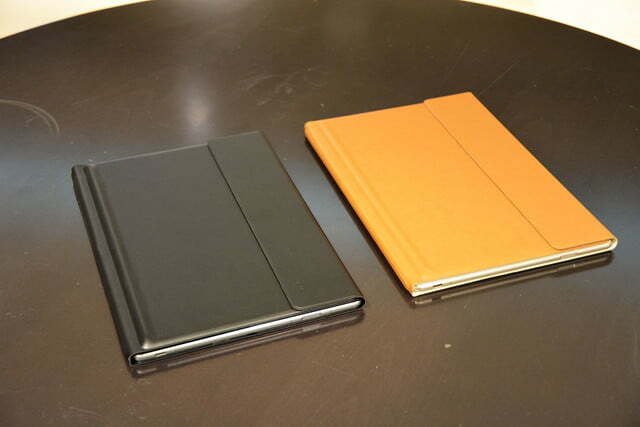 At the time of writing, the M3 MateBook can be purchased through Curry’s website too. 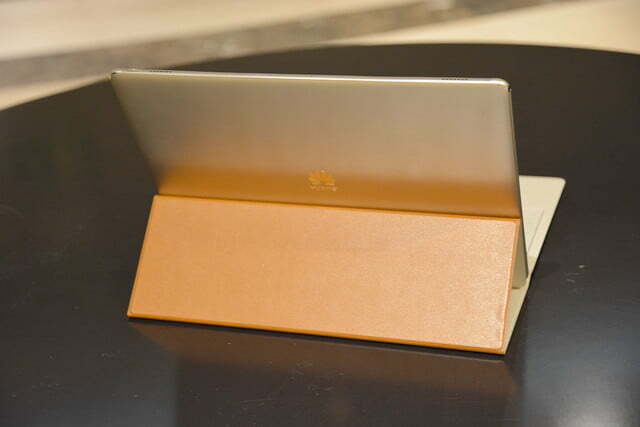 The first thing we noticed when Huawei brought out the MateBook in its keyboard folio case was how incredibly thin the entire package was. 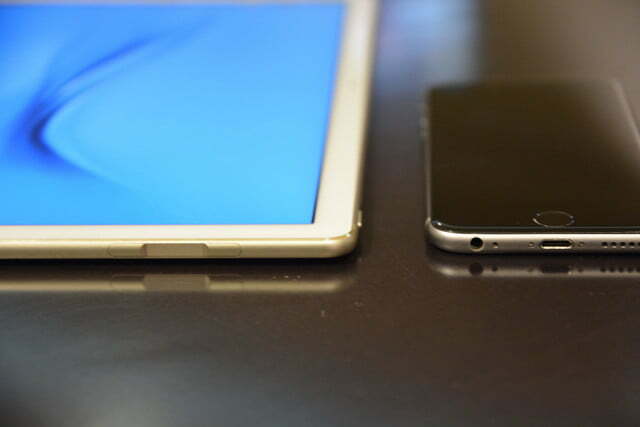 It’s a mere 6.9mm thick; we put the iPhone 6 next to it and saw that they were almost equally thin. Given the incredibly high-powered specs inside the thin tablet and the large battery it houses, it’s a huge accomplishment. Samsung’s Galaxy Tab S Pro is ever so slightly slimmer at 6.3mm, but the MateBook weighs less at 640 grams versus the Galaxy’s 693 grams. 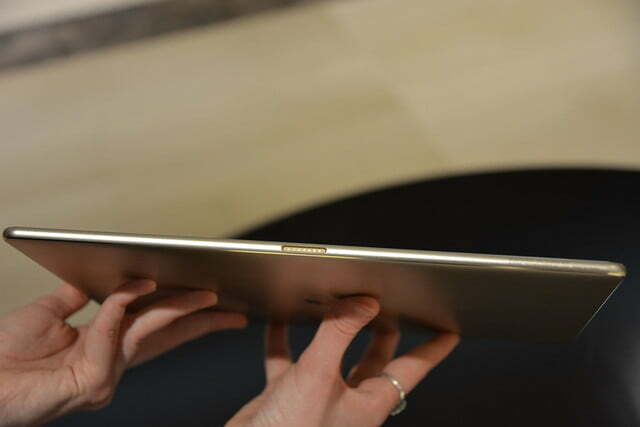 Huawei used its special heat-dissipation technology to create a fanless design, and the result is a gorgeous tablet that actually looks like a tablet. 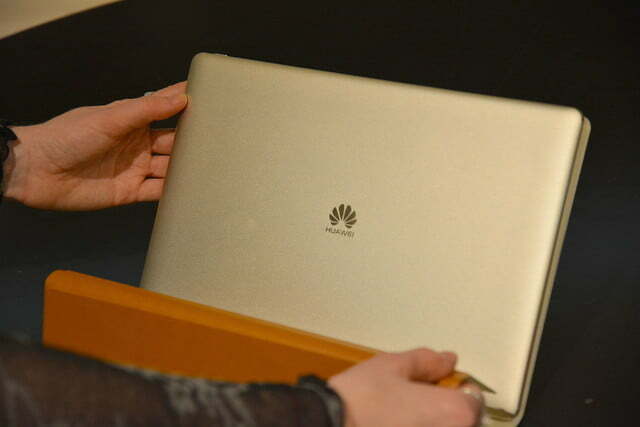 When it’s separated from the keyboard, it looks more or less like an iPad with a Huawei logo on the back. 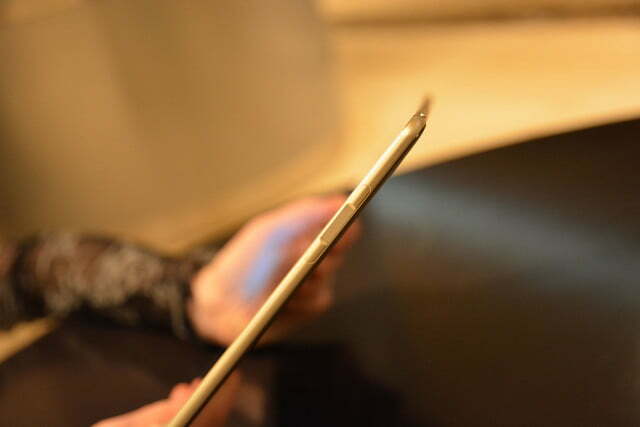 Its sleek aluminum body feels sturdy and seamless. 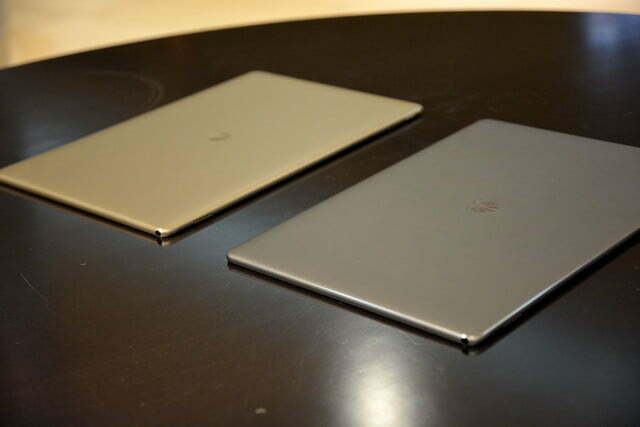 The MateBook comes in champagne or “Space Graphite,” which sounds — and looks — an awful lot like Apple’s Space Gray color option. 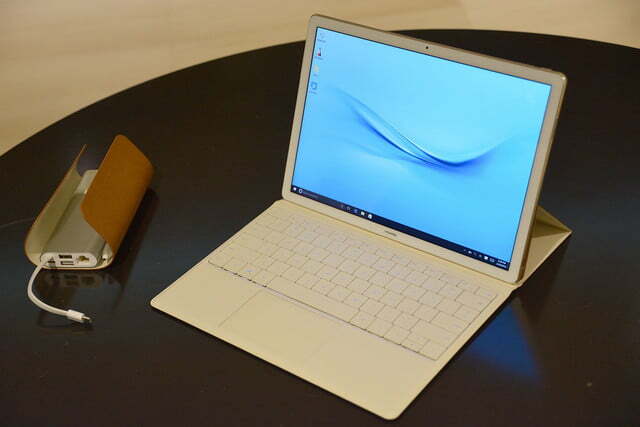 Regardless of the comparisons, Huawei’s MateBook shines as a tablet. 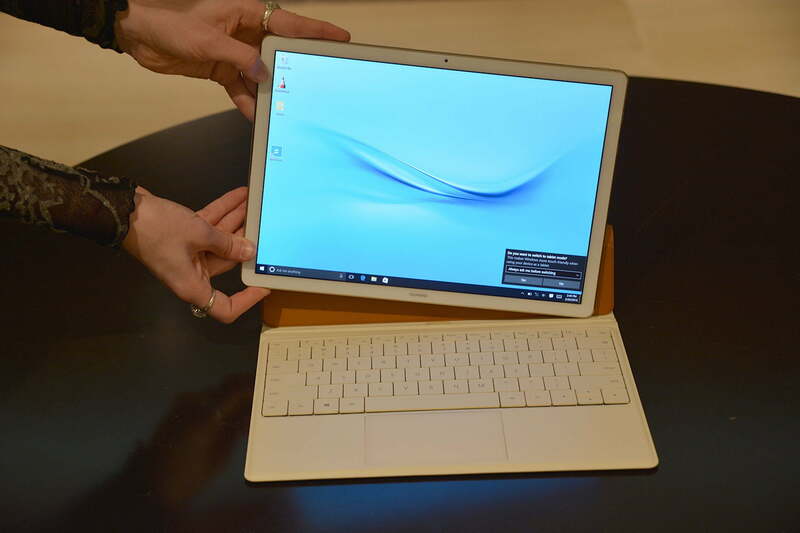 Much like Samsung’s TabPro S, it’s a truly mobile-first product, which may not please PC purists. 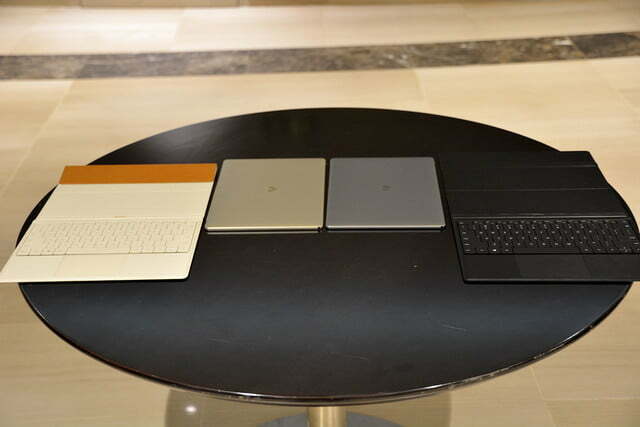 For them, there’s the Surface Pro 4. 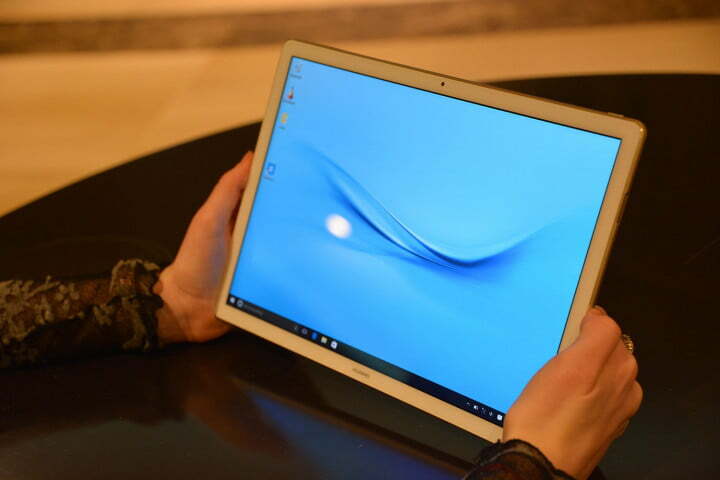 For the mobile-first computing generation, there’s the Samsung’s TabPro S and the Huawei MateBook. 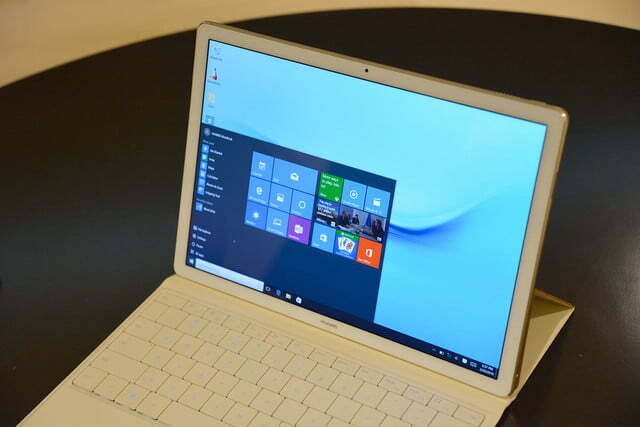 The MateBook sports a Quad HD, 12-inch screen with a 2,160 × 1,440 pixel resolution and an 84 percent screen-to-body ratio. 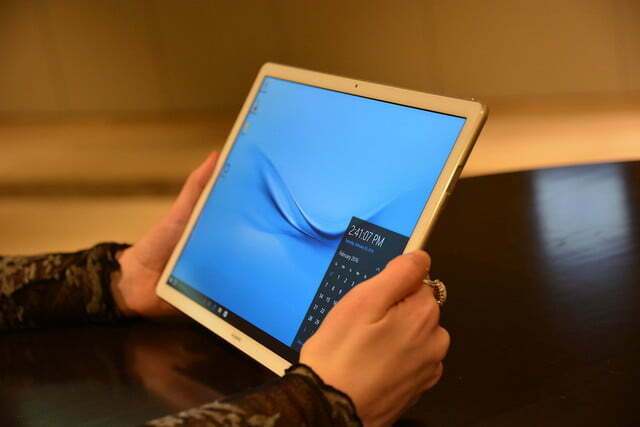 The bezels are very thin, which enhances its appeal as a tablet, while also making the screen look larger when it’s connected to the keyboard folio case. 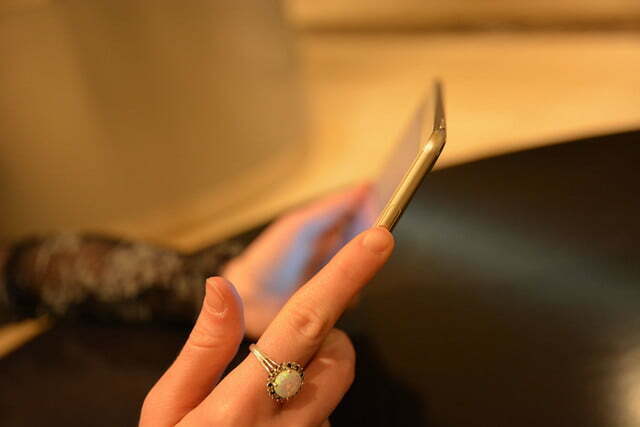 Along the right edge, there are two volume buttons separated by the same 360-degree fingerprint sensor that was on the Mate 8. On the top right corner sits the power button; there are also two speakers with Dolby sound, a headphone jack, and a Type-C USB port. 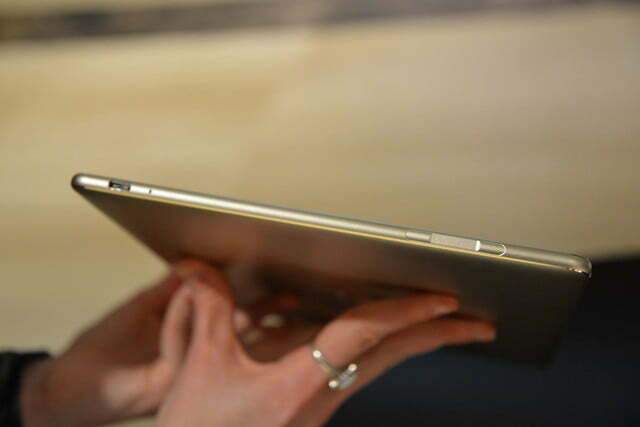 Huawei declined to put a camera on the back of the tablet, but did pop a 5-megapixel camera on the front. Along the bottom edge are 5 pogo pins that connect to the keyboard case. At first glance, the keyboard folio case looks like a normal case, but it boasts a full QWERTY keyboard with a glass touch pad. The keys have 1.5mm travel, but just like any thin keyboard case — whether it be from Apple, Samsung, or Microsoft — Huawei’s isn’t that great and the keys feel flex a bit. 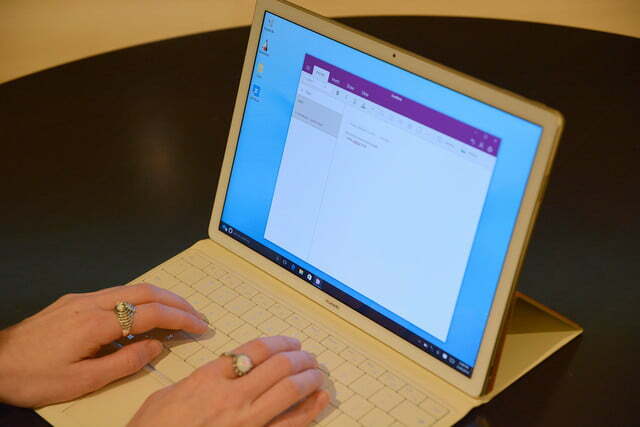 You could get by with it, but it doesn’t seem ideal for those who do a lot of typing. 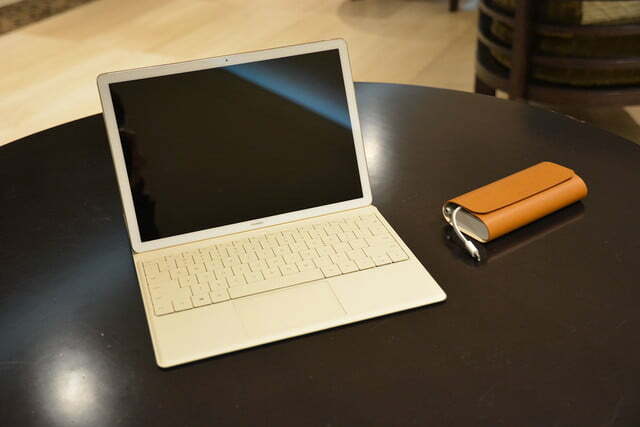 Huawei didn’t say whether there will be third-party accessories for the MateBook, but we hope there will be more keyboards — perhaps from Logitech or Zagg. 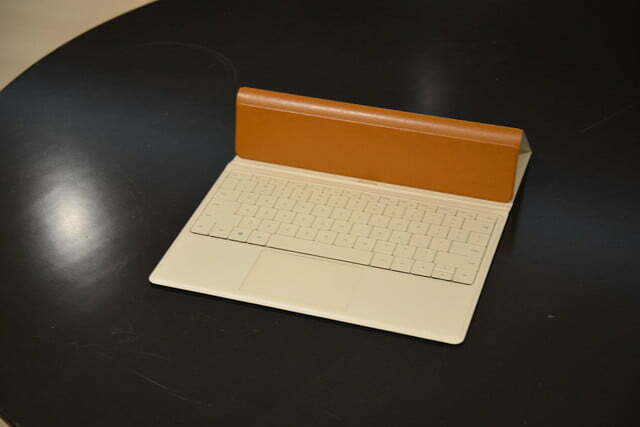 We saw the keyboard case in brown or black PU leather, which felt fairly decent for pleather. 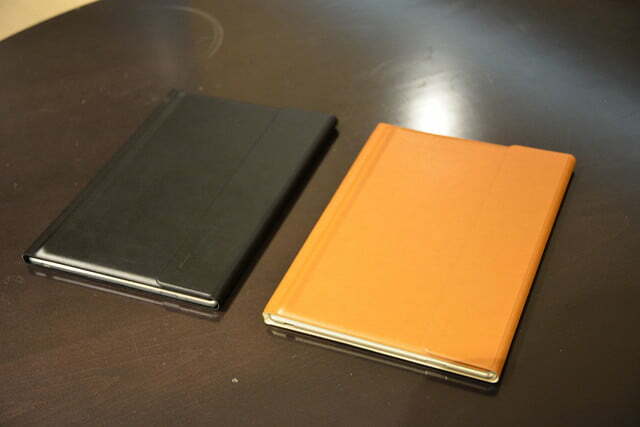 (Huawei diplomatically calls it “vegan leather.”) The brown case is a creamy white when you open it, while the black one is all black inside. Other color options will be available, too. And the keyboard is backlit, which is pretty nifty. Just like Samsung’s Galaxy TabPro S, the Huawei MateBook packs the powerful Intel Core M 6th generation processor family — your choice of specific model. You can also opt for either 4 or 8GB of RAM and a 512 GB solid state drive for storage. 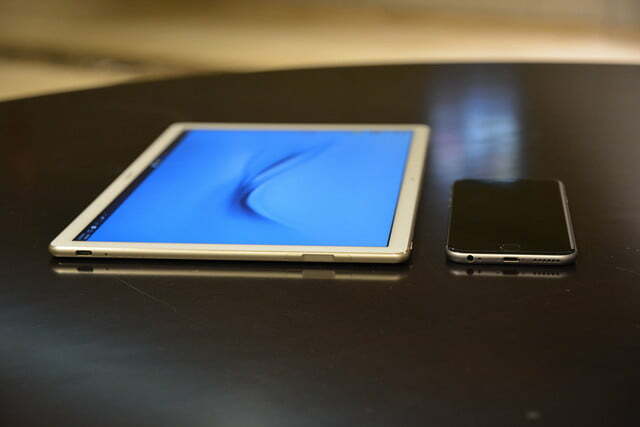 Although it won’t match the Surface Pro 4 in terms of power (the Core M can’t meet the Core i7’s computing performance), it will go toe to toe with Samsung’s new 2-in-1 and should be reasonably powerful. It runs full Windows 10, so it really can act as a laptop replacement, if you so choose. 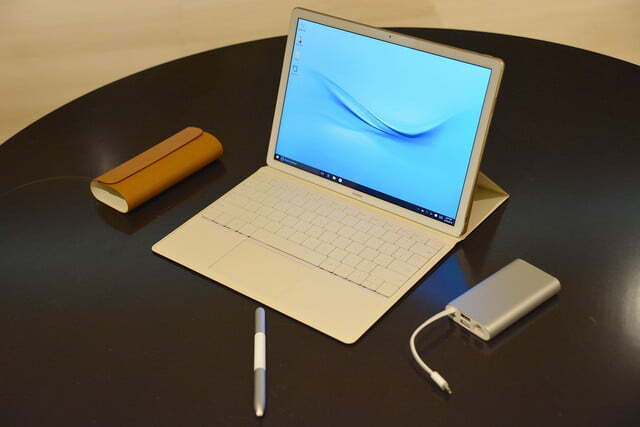 The MateBook charges via USB Type C and supports Quick Charge, so you should be able to juice up in 2.5 hours. Luckily, you shouldn’t have to plug in too often, as the MateBook is rated for 10 hours of mixed use. 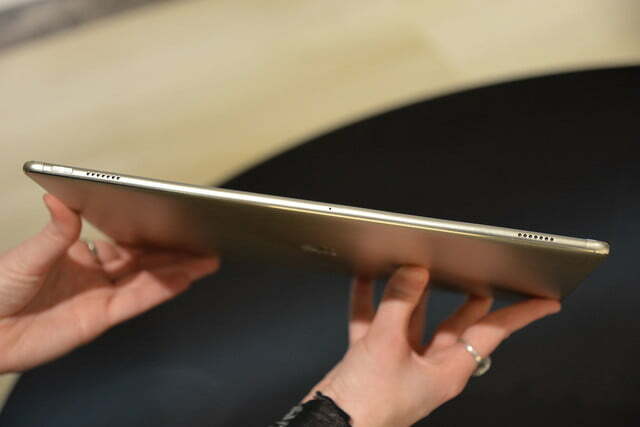 That puts it on par with Samsung’s tablet and the iPad Pro, as well as many laptops these days. 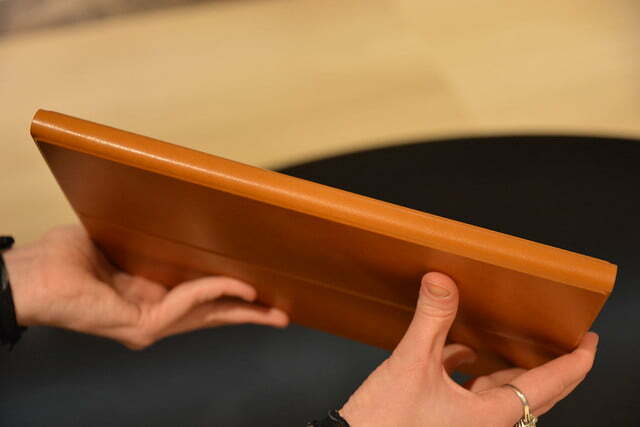 Obviously, we’ll have to test the device for an extended amount of time to get a real feel for how it works as a laptop, but we could see this being a viable laptop option for some people — depending on the price, of course. 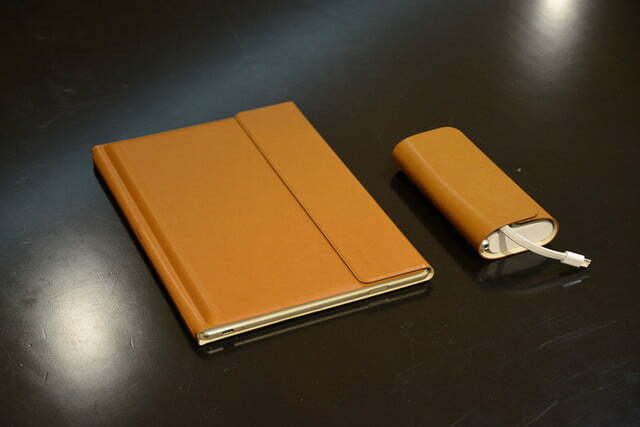 Of course, since the MateBook doesn’t have that many ports, Huawei made its own little accessory, which has a number of them and comes in a matching pleather case. 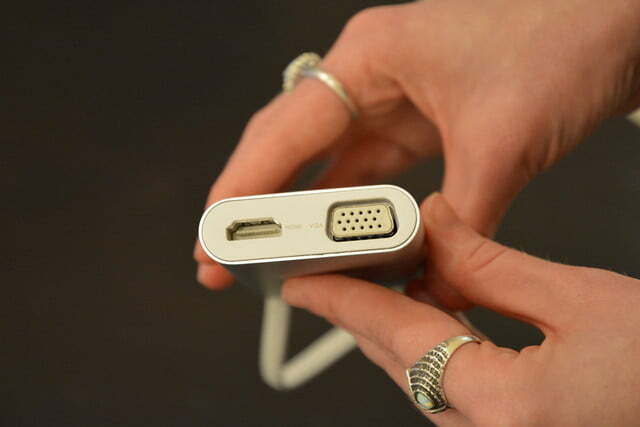 The slim, oblong accessory dock has two USB ports, one USB Type C port, a VGA display port, an HDMI port, and an Ethernet jack. 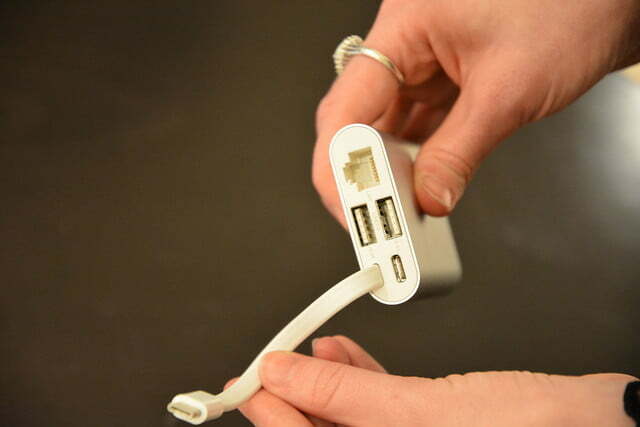 It connects to your MateBook via a USB Type C cord that’s built into the dock itself, so you don’t have to rummage around for a cord. 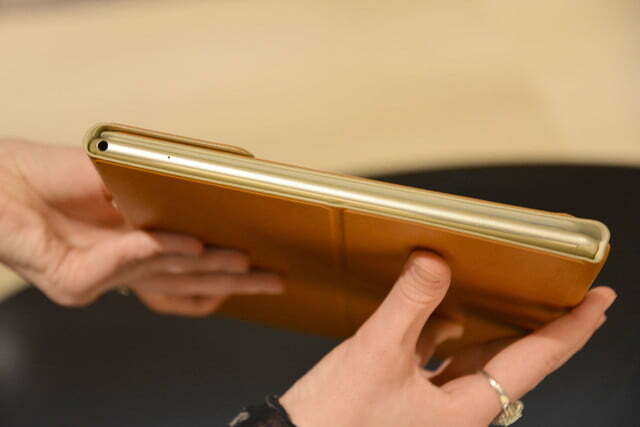 With the dock, you can connect your MateBook to a display and a number of peripherals, just like you would your laptop. 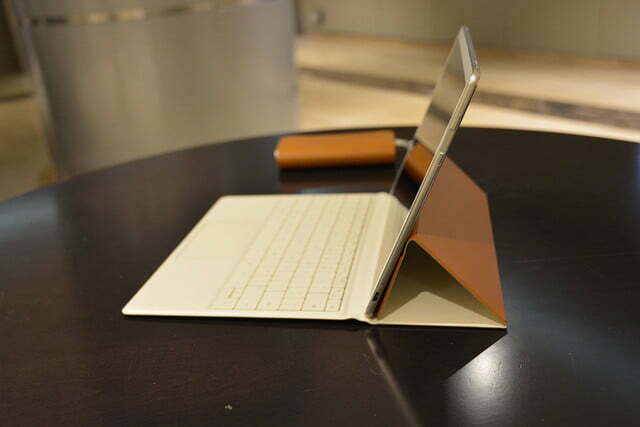 It’s made of aluminum to match the MateBook. 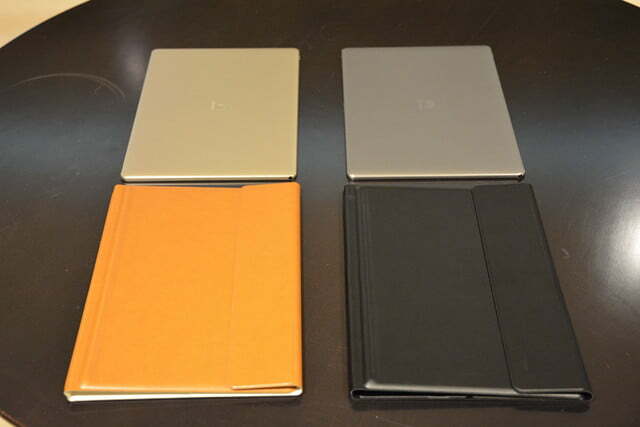 It’s unknown whether the dock will come with the MateBook or be sold separately. 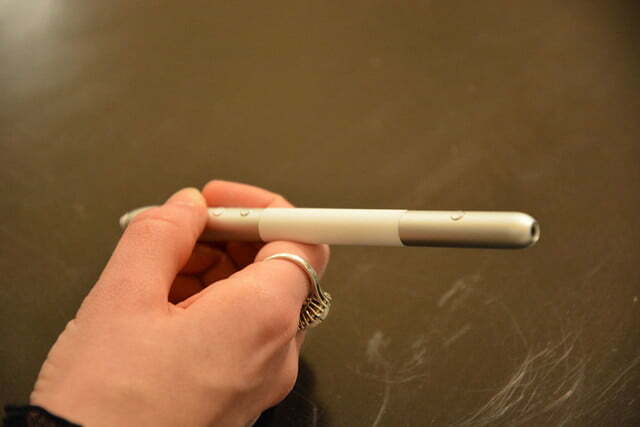 Keeping its business users in mind, Huawei made a Bluetooth stylus that has 2,048 points of pressure, 2 programable buttons, and a laser pointer. 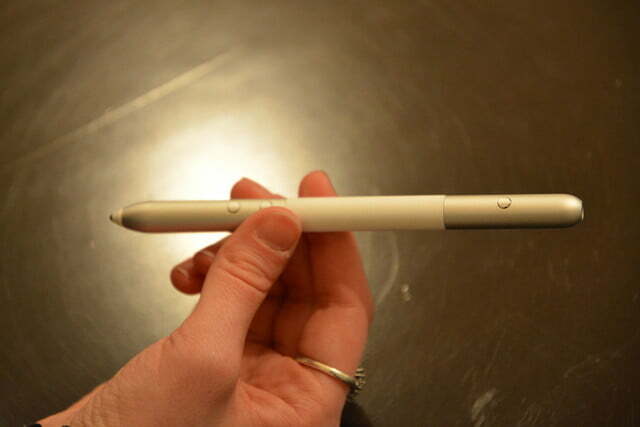 The fine-point stylus looks and feels like a slightly chubby metal pen. 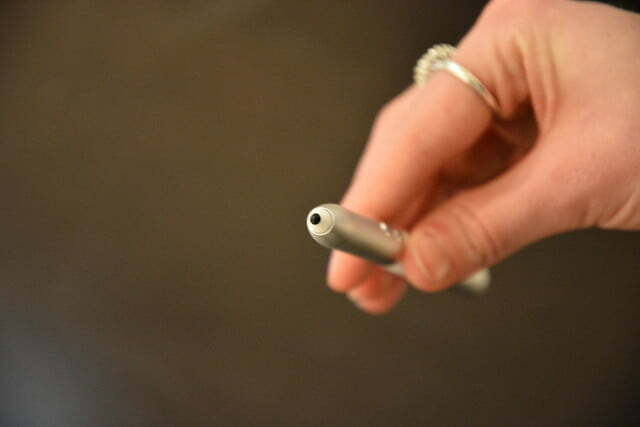 It has a nice grip in the middle, so it won’t slip when you’re writing or drawing. 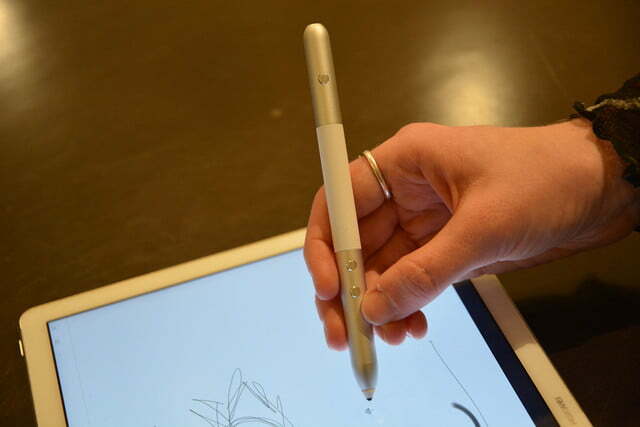 We sketched with it a bit during our hands-on time and were impressed by the lack of lag. It wrote and drew smoothly and accurately, just like a pen would on paper. 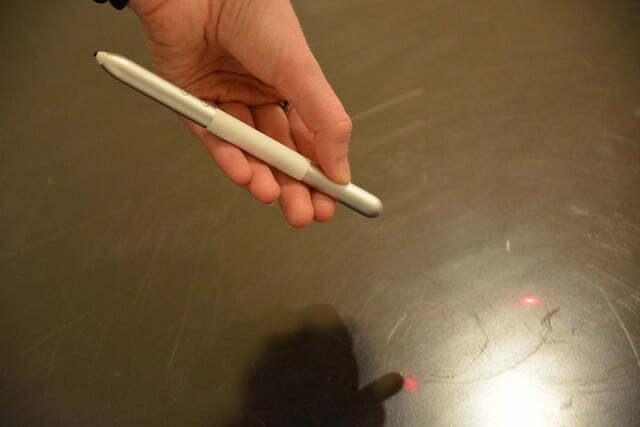 One of the programmable buttons can act as an eraser, which is a great feature for a stylus to have. 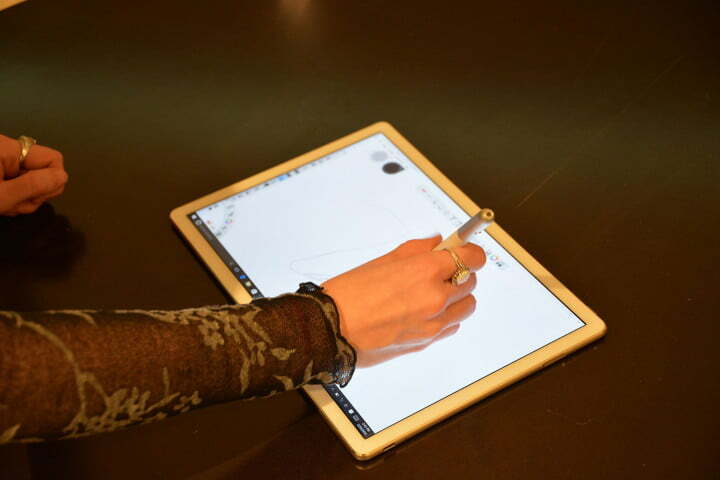 It doesn’t have the ability to make wide strokes unless you change the brush you’re working with, so it’s best suited to note taking, though it can match any Adonit stylus in terms of drawing or writing — and that’s high praise. 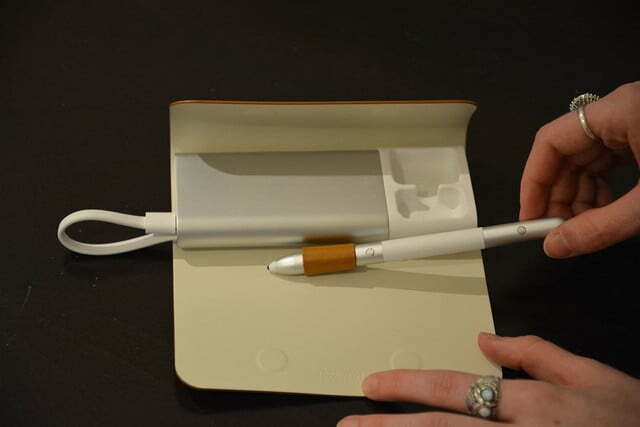 It’s no Apple Pencil, but then again, nothing is. 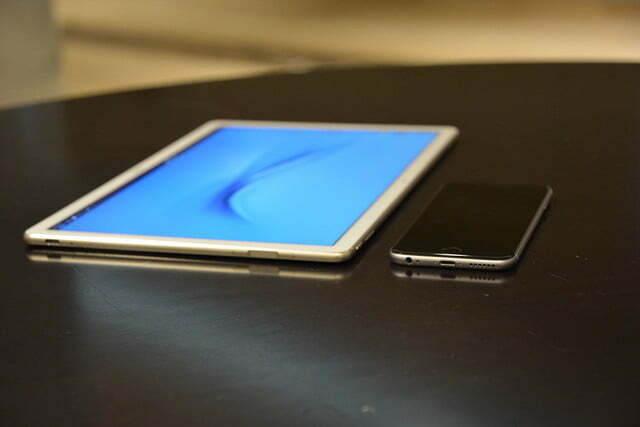 As with the dock, we don’t know whether it comes with the MateBook or sells separately. 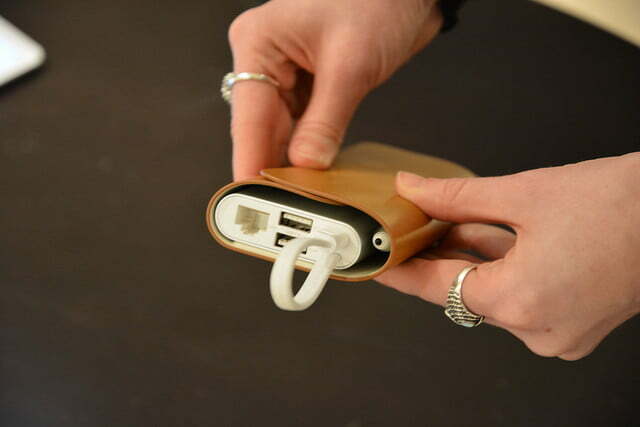 It also slides neatly into the pleather case with the dock. 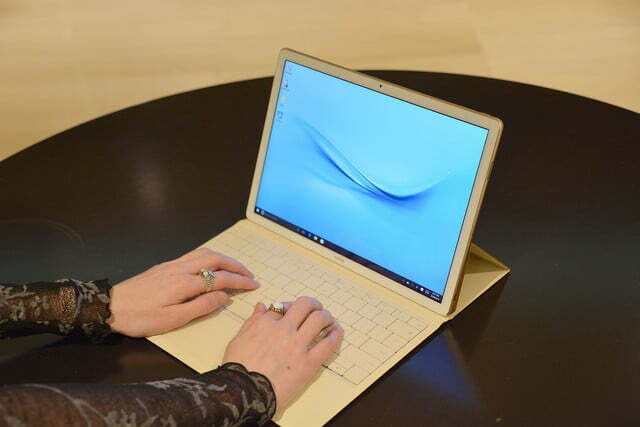 Huawei’s MateBook is sleek, slim, portable, and fully mobile. 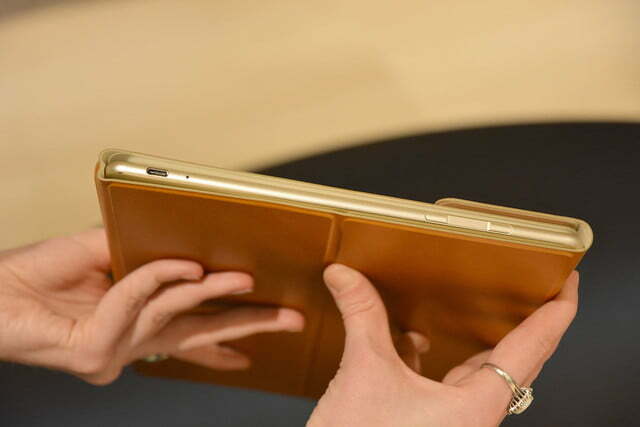 We were impressed by the style and cohesive look of the new device and its accessories. 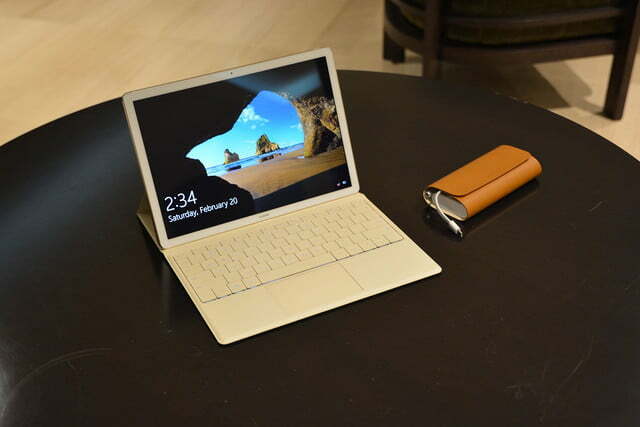 It’s a truly mobile 2-in-1 that will appeal to those who grew up on tablets or just don’t want to carry around a clunky laptop. 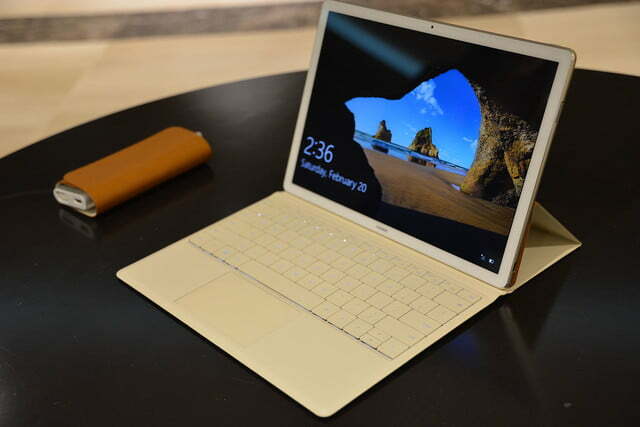 It looks sleeker than Samsung’s TabPro S and the Surface Pro 4, but its keyboard is lacking. 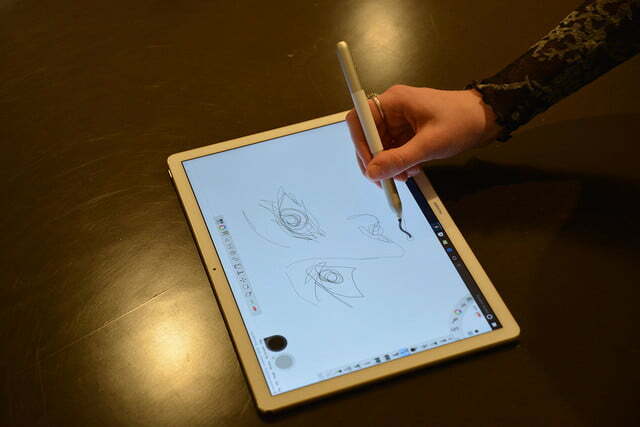 In terms of design, it’s more in line with the iPad Pro, though Windows 10 and the Intel Core M chip give it a much needed edge over Apple’s biggest tablet. 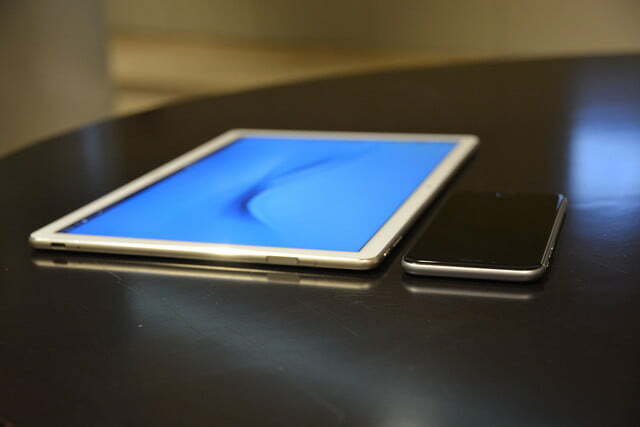 Since it’s like the iPad Pro and everything comes separately, we imagine it’ll be a hard sell for many people. Because Huawei still isn’t as well-known in the U.S. as Samsung, Microsoft, and Apple, it would have been better off having an edge on price. 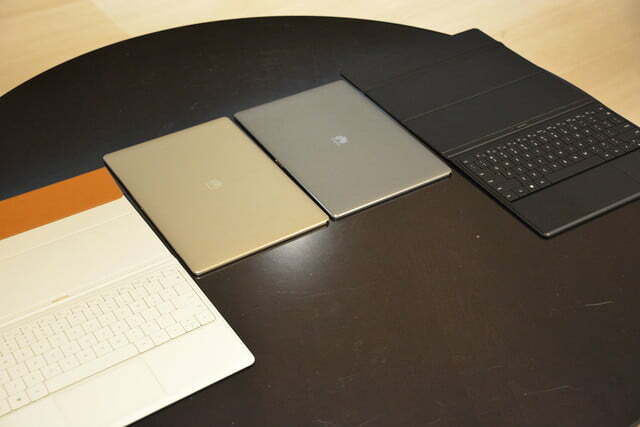 As it is, the MateBook is expensive, particularly when you want all the accessories. Article originally published in March 2016. Malarie Gokey, Julian Chokkattu, and Andy Boxall have contributed. Updated on 08-12-2016 by Andy Boxall: Added in release and price details for the MateBook in the U.K..